About a year ago a unique sewing bee formed that asked each member to choose a monthly theme/inspirational source and color palette. 10 quilters would then go forth and make "blocks", blocks become a quilt, one for each month. In this process we bee members have gained new skills, explored different designs and close friendships have grown. Somewhere in this whole creative endeavor other talented people have observed our journey and have asked to participate. Unable to keep a good thing to ourselves, we have created a companion community #inspiredbybeesewcial to sew right along with us. We will continue to post our monthly inspiration on IG with dual hashtags. We ask only that you use #inspiredbybeesewcial when you post your makings. This larger group #inspiredbybeesewcial is about being a respectful, supportive, creative, collaborative community and making ourselves better designers and sewists. 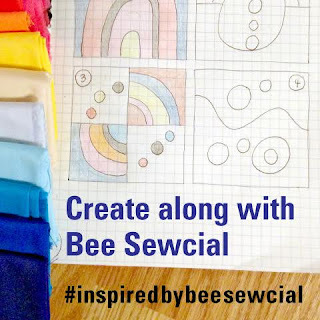 If you would like to be part of this companion community, you may follow monthly "instructions" on our blogs and tag your pictures on IG with #inspiredbybeesewcial. You will find us commenting on all your creativity over in #inspiredbybeesewcial creative space. So, are you ready? Hillary @entropyalwayswins is point for September. Look for her mission to us all in the last week of August. The other co-conspirators (and people you might want to follow just so you don't miss anything) are: Leanne @shecanquilt, Debbie @aquilterstable, Diane @ylmommyx4, Marci @marci_girl, Felicity @felicityquilts, Karen @capitolaquilter, Kari @quiltsforthemaking, Melissa @weshallsew and Stephanie @spontaneousthreads.